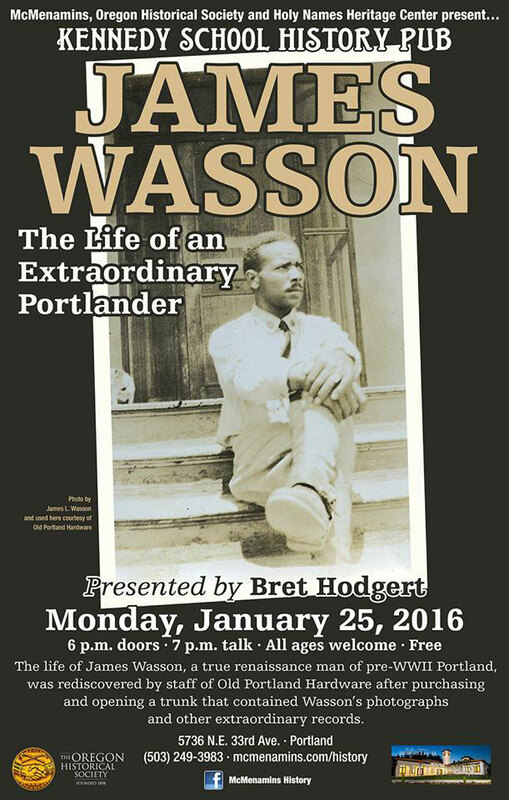 James Wasson: The Life of an Extraordinary Portlander, the latest History Pub, takes place Monday, 25 January 2016 at the Kennedy School (5736 NE 33rd). The life of James Wasson, a true renaissance man of pre-WWII Portland, was rediscovered by staff of Old Portland Hardware after purchasing and opening a trunk that contained Wasson’s photographs and other extraordinary records. A Buffalo solider, early African American photographer, and community leader, exploring Wasson’s life provides a unique view onto Portland’s history. Old Portland Hardward owner Bret Hodgert will tell stories of how he followed clues among Wasson’s materials – including photographs of people and events, a letter from Wasson’s employer, and correspondence related to Wasson’s military service – to reconstruct the biography of this extraordinary Portlander and to understand the community in which he lived and worked. History Pub is presented by McMenamins, Oregon Historical Society, the Oregon Cultural Trust, and the Holy Names Heritage Center. This event is free and open to all ages. Doors open at 6 PM, and the talk begins at 7 PM.